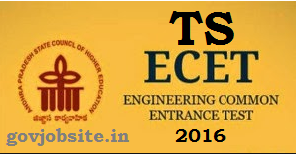 Telangana State Engineering Common Entrance Test 2016, TS ECET 2016, JNTUH- Jawaharlal Nehru Technological University Hyderabad has announced Engineering Common Entrance Test Notification for Diploma holders & B.Sc (Maths) Degree Holders being conducted on behalf of TSCHE. TSECET 2016 Notification for FDH and B.sc. (Mathematics) students who ever want to enter into engineering Study? This is the brief Information about the TS ECET 2016; this is only a Notification for Entrance test. Candidates / Students have to full fill the eligibility criteria laid down in the relevant G.Os at time of Admission.